KANSAS CITY, Mo. 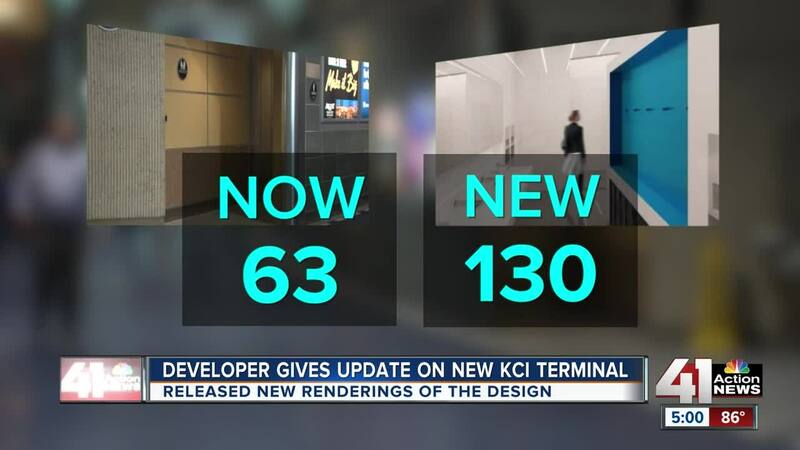 — It’s been a long wait, but the Edgemoor team released an updated set of renderings Aug. 16 for the new single-terminal Kansas City International Airport . The renderings, which were released during a Kansas City, Missouri, City Council committee meeting about the project, offer the public an updated peek at Edgemoor’s vision for a new airport . The two-story fountain inside the terminal, which was included as part of the initial theoretical design, has been nixed, though it could return in some form. "We realized we needed that room in that particular location within the terminal for passenger processing, to get people efficiently through the terminal," associate architect Jordan Pierce explained. From a practical standpoint, travelers should be pleased to learn Edgemoor has included double the number of bathrooms (130) compared with the current set-up (63) after the security gate. Details remain to be ironed out, including ways to ensure the airport reflects Kansas City and makes it unique and memorable for arriving passengers. "Concept design is about getting the big ideas down. The next phase is to layer in the details, to get a lot of that character, the aspects that will make it seem like Kansas City," Pierce said. To identify those aspects, Edgemoor will host a series of open houses to get feedback from the public. "We can have individuals go in and talk to the designers and say okay, I see that you've got this bathroom set up this way. Have you thought about x, y and z? I think people are really going to love having that sort of interaction," Councilwoman Jolie Justus said. Other details, such as color schemes for the parking garage and other minutiae, also could change as the project continues to evolve during the next four years before a planned opening. Progress also has been made on some of the more contentious aspects of the project, including a labor agreement. The announcement from Edgemoor that a labor agreement had been reached drew applause in the council chamber. The community benefits agreement still needs final approval from the Federal Aviation Administration, which has some strict rules about how money can be spent on airport projects. If elements of the agreement are struck down, Edgemoor has agreed to fund the benefits. Still waiting on @FAANews approval for community benefits agreement. Did receive a response from them, but working on concerns. FAA strict on airport revenue only being used directly on airport. If not approved by FAA, @KCIEdgemoor has agreed to fund the CBA. Edgemoor was selected earlier this year as the company to build the new terminal after voters approved the project in November 2017. The city has received a pledge from Edgemoor to have the new airport operational before the National League of Cities' 2022 City Summit , which will take place in Kansas City. The project's scope and cost changed two months ago , adding as much as $350 million and an additional year of construction to the project.